April is Gardening in Schools Month and now is the time to start planning and preparing for your school garden. Maybe you have created school gardens in the past, or have considered it. Either way, careful preparation is key to getting off to a good start. Build Enthusiasm – preparing and maintaining a garden is a lot of work, so you need dependable support and teamwork from students and adults. Motivate students by asking them to share their family experiences with gardening and bring in parents or community members who enjoy gardening. Another way to share ideas is through a bookmarking tool like Symbaloo (TeachersFirst review). This Symbaloo mix includes links to growing information about common garden plants and flowers. Share this mix or create your own to add videos, websites, and games about gardening. Plan Ahead – start planning now. What kind of support do you need – financial, physical, background knowledge? What plants and flowers grow best in your location? How will you maintain the garden through the summer while school isn’t in session? There are many sites sharing ideas and suggestions for school gardening. 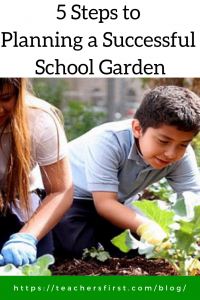 KidsGardening (TeachersFirst review) is one of the most comprehensive resources for finding educator resources, grants, and programs, and the site also includes a gardening toolbox full of advice from seasoned educators. Students will love seeing quick results of their work. Plan on starting with quick-growing plants. This article shares many suggestions for easy to grow and quick starting plants. You don’t want to be left holding the bag when no one shows up to help. Use a project management tool like Wunderlist (TeachersFirst review) to collaborate and plan with garden helpers. Schedule volunteers and tasks like weeding and watering, then use Wunderlist to chat with your helpers as needed throughout the growing season. Ask other classes to participate in your garden; maybe one group plants flowers, the other group plants vegetables. Collaborate with a class in a different climate and compare planting times, optimal plants for each location, and growing speeds. Funding – depending on the size and contents of your garden, funding might be an issue. Ask parents to donate seeds, dirt, fertilizer, and garden equipment. Many teachers have success creating wish lists on Amazon to share with parents and the community. KidsGardening has an entire page devoted to the funding of school gardens. Visit this page to look for grants and programs to meet your needs. Make a wheelbarrow garden – there are many reasons why this is a great idea. The smaller size makes it easy to manage plants and flowers, and if you are tight on outdoor space, the wheelbarrow stays inside overnight and is pushed outside for sunlight during the day. This article spells out exactly how to make a wheelbarrow garden. Do you or your students’ families have a red wagon laying around that can be donated? Plant your garden in it! Here are 10 Ways to Use a Red Wagon for Inspiration. Try container gardening. Ask local landscapers for spare pots and containers to use for planting small groups of plants and flowers. Share your success and learn from failures – gardening is an excellent choice for teaching about nature and plants, but it also is a character building opportunity. Be sure to document and share learning within your classroom and your community as you take on this learning experience. Have students create online diaries documenting the progress of your garden and their role in maintaining it. Buncee (TeachersFirst review) includes many features for creating, recording, and sharing student portfolios. You can even embed YouTube videos in their creations! Reflect on your gardening experience as a class using Synth (TeachersFirst review). Think of Synth as an audio version of Twitter. Post your conversation prompt; then students add recordings up to 256 seconds in length with their response. Responses are threaded together to make one podcast to share on your class website or blog. Invite adult volunteers to participate in your reflective process as part of your ongoing collaboration. Take a look at this amazing site sharing the work of City Schoolyard Garden for inspiration on telling your story. Their delightful blog shares their gardening stories taking place all year long. You don’t have to look far to discover the many benefits of creating a classroom garden both academically, socially and emotionally. Think about the many different methods of gardening and what could work for you and your students and give it a try! Do you already maintain a school garden? What worked for you? What didn’t work? Do you have advice for getting started? We would love to hear your suggestions below.